Gold jumped nearly 5% on Wednesday to its strongest in six weeks, as investors snapped up safe havens with Republican Donald Trump winning the race for the White House over Democrat Hillary Clinton. 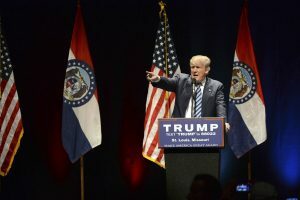 Saint Louis, MO, USA – March 11, 2016: Donald Trump talks to supporters at the Peabody Opera House in Downtown Saint Louis. A Trump win, which could lead to economic and global uncertainty, may also push the US Federal Reserve to hold off from raising interest rates next month, further burnishing gold’s draw. Trump scored a series of surprising wins in battleground states including Florida and Ohio on Tuesday, opening a path to the White House and rattling world markets counting on a Clinton win. The US dollar sank, and stocks plummeted as investors faced the shock win by Trump. Sovereign bonds surged, and the Mexican peso sank. Spot gold rose as much as 1.7% to $1,297.13 an ounce, its strongest since September 27. Gold for December delivery was up 1.9% at $1,298.70 an ounce after rising about 5%. US rates futures imply traders see only a 36% chance of the Fed raising interest rates next month, which should support further gains in gold. Spot silver rose to $18.996 an ounce, its highest since October 3, and was last up 2.39% at $18.78. Platinum rose nearly 0.2%, and palladium was off 0.4%.